This man pleaded guilty to fraud Tuesday, part of a company that former Mayor Mary Verner once said would "be the foundation of new opportunities in the area driven by their developmental technology." In March of 2014, Sean Michael Borzage Boyd, the former executive vice president of global business development for BlueStar Digital Technologies, was not happy with The Inlander's cover story on the BlueStar Digital Technologies, a company the FBI had raided in Nov. 2013 on suspicion of fraud. He sent an email with the subject line, "Thanks." 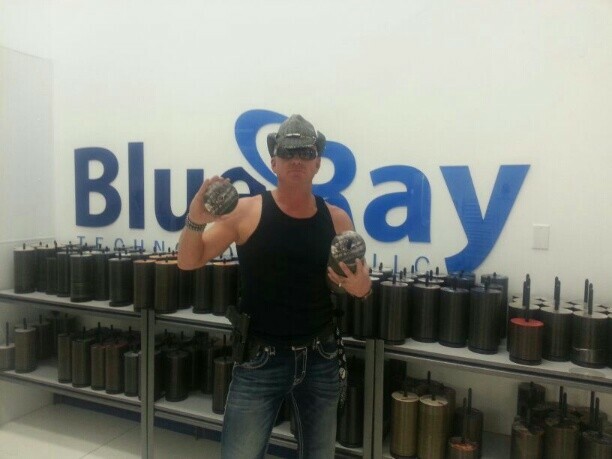 - From January 2007 to October of 2010, [BlueStar CEO] Erick Hansen and others raised $7.6 million from about 200 investors, despite the fact they didn't even have a license to print Blu-ray discs until 2012. Boyd was involved with or received commissions of $2.4 million of that. - Boyd told at least five investors that they had a contract to produce Blu-rays with Michael Jackson footage, but the company never took meaningful steps to produce that contract. - Boyd pushed an investor to transmit $50,000 to BlueStar, citing a contract to distribute an animated film. At that time, the contract had already expired and BlueStar had no ability to actually manufacture Blu-ray discs. - In another email to an investor, Boyd referenced a $20 million partnership with a major independent film company, despite the fact they were not partners in any binding way, and there was no deal. "Erick's got this Blu-ray thing in his blood," Boyd told me last year in an interview. "I believe in him, I believe in him, I believe in him." The Spokesman-Review reported that, initially, Boyd stuck with his story: He was a true believer. But the judge didn't let that stand. Boyd, clad in a suit jacket and jeans, returned to the courtroom two hours later and entered a guilty plea that Rice accepted. “I aided in raising money for a Blu-ray facility that was not making any discs,” Boyd said. This isn't Boyd's first run-in with fraud allegations. In a blog post last year, I noted his long history. But the one thing that can't quite be captured by court documents: Boyd's mix of manic optimism, paranoia and incoherence. “Throughout the dot-com bust, the nation’s economic disaster, throughout the Mayan end of the world in 2012, Erick Hansen didn’t sell out. He won’t stop because he loves the shareholders," Boyd told me in my phone interview with him last year. "Erick Hansen has not in any way shape or form done anything wrong. He’s done nothing but increase the company’s productivity." I asked Boyd about the documents showing that, at one time, Hansen had fired him. "We got into a fight. It happens," Boyd said. "You deal with high pressure, high stress, I might have yelled at him. He’s a business man. I’m an alpha male." He took aim at Barb Pielli, a former investor and employee who sued the company for fraud. "If she spent the time trying to help Erick instead of trying to unthrone him, we’d have a company that’s viable," Pielli says. He said he got paid about $100,000 a year by BlueStar. He told me that he made more than $330,000 at BlueStar, but said he was worth it. "Since I [joining] with the company, it’s increased revenue, and increased productivity," Boyd said. In his plea agreement, he admitted he had made as much as $450,000. I WAS TOLD BY THE "THE MAIN MAN" FROM THE TIP TOP STUDIO IN THE WORLD " The Biggest of the Big, WE WILL HAVE A DISTRABUTION AGREEMENT, BUT NOT UNTIL WE HAVE FULL REDUNDANCY IN BLUESTAR`s BLURAY LINES. ITS JUST BUISNESS POLICY FOR OUTPUTTING PROCEDURE , NO WAY AROUND IT. We are at the door we just need to cross the threshold and forvthe second time Entertainment lightning strikes 2 xs with ERICK "THE BLUE" :) HANSEN..
And this wasn't just his correspondance with reporters that could be a bit out of control. He took the same tone with emails to investors. In January, after the FBI raid, he sent out an email to investors titled "Good News to All of our Partners!" asking the shareholders, who had seen zero return on their investment, to send a letter to thank Erick Hansen for sticking with it. Erick Hansen Has Expressed His Gratitude To All The Share Holders For Their Unwavering Support. He is confident that we together as a team, once again can march forward based upon the growth over this last year and our New Motion Picture Especially " Dominion". We have come to far to rip each other apart! We will not let the same 5 or 10 shareholders that have been trying to hurt the company for 7 years to be the voice of 240 partners. Who has a real investment intact and viable after 7 years? After the DOTCOM FALL, MORTGAGE FALL, GLOBAL BANKRUPTCY, 2012 MAYAN APOCALYPSE ETC..
BLUESTAR is still alive so send ERICK a thank you letter and for staying in the GAME..
We all need encouragement. If You haven't send thank you this year please do it now. Thank you Erick for Dreaming that we could have a American Blu-ray company! What can I do to Help? Click on Dominion Links Below! That film, Dominion? It's a microbudget movie, funded with BlueStar investor money and directed by Rico Lowry. He appears to be the son of Don Lowry, the con artist profiled in a recent This American Life episode. Amazon reviewers have not been kind to the movie.